Learn the process of how bourbon is created while sampling some of the the finest bourbon available. This tour includes distillery tours and tastings at Woodford Reserve, the producer of the Official Kentucky Derby Bourbon; the oldest continuous bourbon distiller which is Buffalo Trace and the multiple "Distillery of the Year" winner Four Roses Distillery. 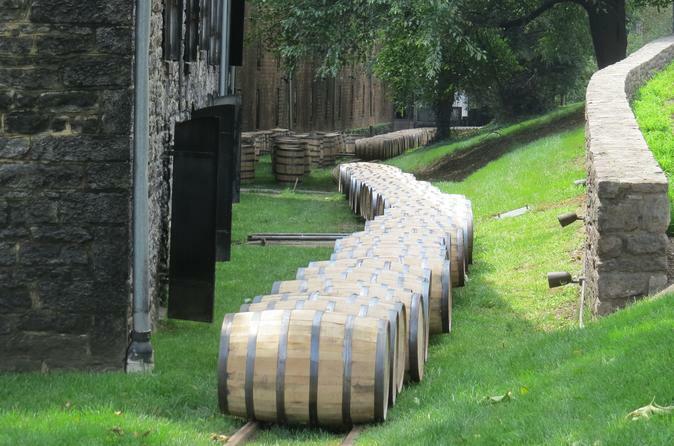 This Lexington based tour provided by a official sponsor of the Kentucky Bourbon Trail includes transportation provided by drivers who are knowledgeable on the Kentucky landmarks you will be viewing through the Bluegrass region and of Kentucky Bourbon and includes all tour and tasting costs at the distilleries. The tour departs from Griffin Gate Marriott in Lexington at approximately 9:00 a.m. (You will receive an email with exact time prior to the date of the tour.) The first stop of the day will be at Woodford Reserve Distillery for a tour of the historic distillery and grounds and tastings of their hand crafted small batch bourbons. The next stop will be at Buffalo Trace Distillery where you will tour the National Historic Landmark distillery and taste bourbon that has 200 years of distilling experience behind it. Lunch will be the next stop at a local restaurant (locations may vary). The final stop of the day will be at Four Roses Distillery, the 2017 winner of "America's Best Kentucky Bourbon" for their 2016 Limited Edition Small Batch, for a distillery tour and tastings. All distillery stops will include time to shop for bourbon and bourbon related items in the distillery gift shops. Finally, you will travel back to Lexington with return to Griffin Gate Marriott at approximately 5:00 p.m. The tour includes transportation provided by expert guides, all tours and tastings and bottled water.